Bike Count Report and Data for 2014 Published! 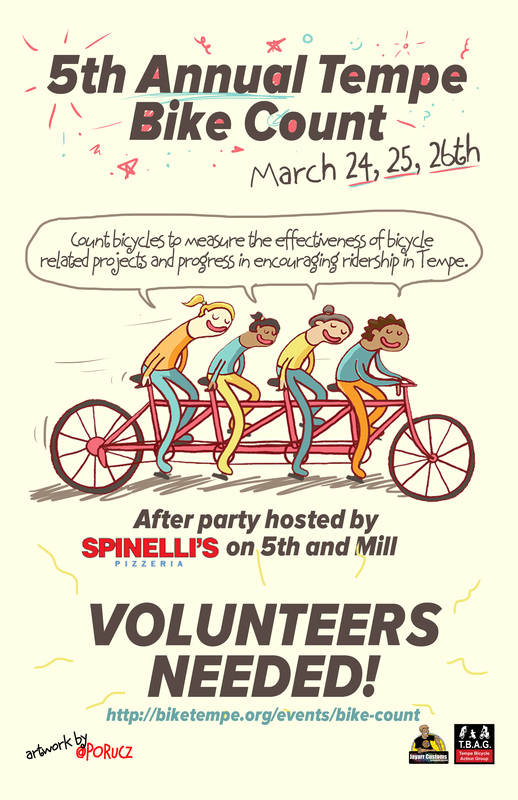 In April 2014, the fourth annual city-wide bike count in Tempe was conducted as a way of understanding cycling habits and to identify routes and intersections that are problematic or dangerous. In total, 12,583 bicyclists were counted from a total of 79 volunteers working two shifts at 48 locations, with 21 common locations between 2011, 2012, 2013, 2014. Thanks to our count volunteers and everyone who helped bring this effort to fruition! Especially thank you to the core Bike Count organizers: Cliff Anderson, Jennifer Guzy, Donna Lewandowski, Stevie Milne, Jeff Caslake, and Alexander Deem. And thanks to Yue “Eva” Zhang and Parth Dalwadi for contributions to the published report.